Maybe you’ve been thinking about updating your bathroom but have been putting it off because of the expense of a full renovation. Finances aside, here a couple of surprising facts that might help you see why a bathroom renovation is such a good investment in not just the value of your home, but also your personal comfort. The average person visits the toilet 2,500 times a year, which is 6-8 times a day, which equates to nearly 3 years throughout the average lifetime. 75% of people use their mobile phones in the restroom, which means you’ll spend more time in there than you would otherwise. With as much time as you spend in this part of the house, investing in a bathroom remodel might not seem so absurd after all. Of course, that does not mean you can’t update the look and feel of your bathroom on a budget. Giving any room a fresh coat of paint can transform and freshen it looks, and the bathroom is no exception. Want it to be a place of relaxation and calm? Try a shade of lavender. Choose a variant of yellow if you want to make it feel bright and energetic. A clean white can provide a modern minimalist vibe to a dated bathroom, but regardless of your color preference, using a satin or semi-gloss base is important when choosing your paint. Much like paint does, lighting can transform a room. There’s almost no room that needs good lighting more than the restroom. Simply replacing dated lighting with new fixtures with warm, soft and complimentary light temperatures can make a world of difference. To further update the look of your bathroom, consider adding a secondary light source to the mix, even if it’s just a small dimmable lamp. 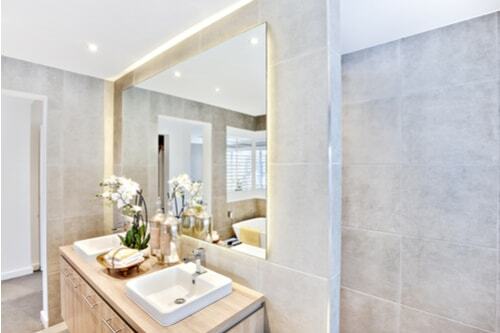 For this one, you don’t have to get rid of your current vanity area entirely, or the mirrors that are already there. Instead, you can simply add decorative molding to create a new and updated look. If your medicine cabinet is beyond hope, a replacement won’t be too expensive or difficult to replace, especially if you select a new model with the same dimensions as the one you are replacing. 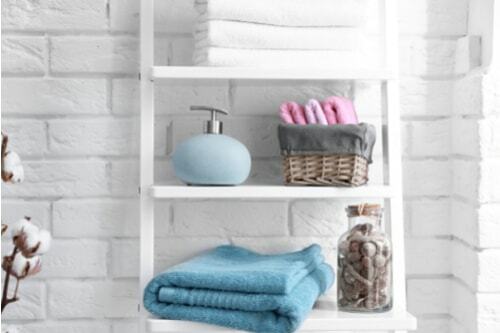 If there’s one single thing that nearly every bathroom needs, it’s more storage. One strategy to accomplish this affordable is to add drawers or stacked trays to existing cabinets. Both of these modular additions are affordably priced and readily available in a variety of styles and sizes at most hardware stores. Another option is to replace your existing cabinets, which can be a bit more expensive, but well worth the investment if you have the means. You don’t have to call in any experts to give your bathroom a fresh look by redecorating. It’s your special place, so why not have fun with it and let your personal tastes shine through? For example, if you like the beach, give your bathroom a new, fun nautical theme. Decorate with shells, beach photographs, a fish shower curtain, a fresh coat of blue paint and some tropical towels to top off the look. While it would be nice to renovate your bathroom, perhaps you’re more concerned with how to simply pay your bills or cover an emergency expense. You might have given up hope for help from the banks or credit card companies due to your credit history, but there are alternatives to these mainstream sources of emergency help, including auto title loans. These fast cash loans are extremely easy to qualify for, and you could get up to $15,000 in as little as 30 minutes, regardless of your credit. While that may be well beyond what you need to give your bathroom a fresh look, keep in mind that the average bathroom renovation runs about $9,000. Suddenly, using these simple and affordable tips for updating the look of your bathroom seems smarter than ever.